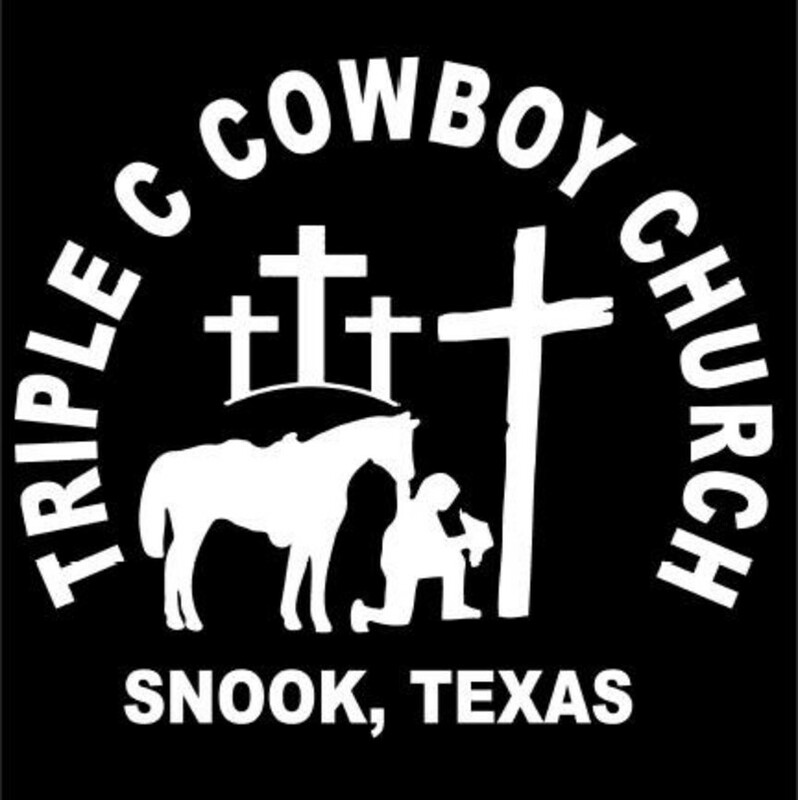 ● Triple C Cowboy Church is a non-profit religious organization/church that – through its arena ministry – offers event participants the opportunity to compete for winnings. ● Events will be located at Triple C Cowboy Church in Snook, 11538 FM 3058, Snook, TX 77878. Any changes to the schedule and/or location will be posted in a timely manner via the church’s website and Facebook page. ● Time – books will open at the time specified for the event on the church website, Facebook page and flyers. ● Triple C Cowboy Church will be giving out added money or prizes throughout the 2019 event schedule. ● Any person’s winnings not picked up one week after the last scheduled event of each series and who does not leave a legible mailing address, will be forfeited and given back to Triple C Cowboy Church Arena Fund. ● TRIPLE C COWBOY CHURCH IS AN ALCOHOL-FREE, ILLEGAL DRUG-FREE, AND PROFANITY-FREE CAMPUS. THERE IS ABSOLUTELY NO ALCOHOL, OR ILLEGAL DRUGS PERMITTED ON THE PREMISES AT ANY TIME. ● All penalties listed throughout the Triple C Cowboy Church Arena Rulebook will be enforced. All arena usage MUST be approved by the arena team leadership in a timely manner, prior to the time of use. All arena events MUST be approved by the arena team leadership and placed on the church schedule. Contact information for arena leadership is posted on the Triple C Cowboy Church website. A fee of $10 is to be paid for each person using the arena for any use outside of a scheduled event. Fees will be placed in a designated area established by the arena leader. Triple C Cowboy Church reserves the right to ban members, guests or others from the arena or church property if arena misuse becomes recurrent or is deemed intentional. ● All entry fees shall be CASH ONLY – NO EXCEPTIONS. ● Any and all protests/disputes must be submitted in writing, within twenty-four (24) hours including a $25.00 protest fee (i.e. horse/rider eligibility). It must also be signed by the protesting contestant. o Anyone from Triple C Cowboy Church arena functions for any reason of misconduct such as rude and inappropriate behavior. o Anyone verbally or physically abusing any event staff or animals. o Any horse that is deemed uncontrollable or unmanageable from Triple C Cowboy Church arena functions. o Anyone using inappropriate language. ABSOLUTELY NO PROFANITY! o Anyone demonstrating abusive behavior in or out of the arena (excessive whipping, "schooling" their horse in the arena during a run, beating around the head, etc. ), as determined by the leadership. ● Any horse believed to be unsafe to the rider or other participants can be banned by Triple C Cowboy Church leadership. o THERE IS ABSOLUTELY NO ALCOHOL, OR ILLEGAL DRUGS PERMITTED ON THE PREMISES AT ANY TIME. o If possession or consumption of such is found, you will be asked to leave the church property. ● Playday events will be scheduled at the discretion of the arena leadership. ● The playday events will not start before the scheduled time. ● Playday events are subject to cancellation due to inclement weather conditions, arena and/or parking conditions, cancellations by proprietor, etc., may be substituted with another location. ● Playday event cancellations will be ruled on within a reasonable amount of time, the day of the playday by the leadership. ● Cancellation information will be available from the leadership team, church website, and Facebook page. Exhibition runs will be provided at the discrepancy of the arena leadership team and posted with the event information. ● The alley/entrance gate will be closed during each run because of the lack of space behind the alley/entrance gate. ● Cash only will be accepted for entry fees. ● Event order: Riderless events (i.e. stick horse race, parent pick-up race), mutton bustin, cloverleaf barrels, pole bending, straight away barrels, and speed race. ● ‘Age Groups: 6 & Under (will include leadline participants), 7yrs-11yrs, 12yrs-14yrs, 15yrs-18yrs. Contestant’s age on the day of the first event will determine the contestants age group for the series. ● Contestants in the speed event classes will be able to enter until the last five (5) runners of the first speed event of the appropriate age group for the contestant. Only ONE entry, per rider, for each event will be allowed. Contestant may use multiple horses amongst the different events. ● Once an entry is submitted, there will be no refunds, unless horse or rider is injured or incapacitated. The refund will ONLY be given IF the class has NOT begun. Horses may be substituted until the first horse in the class runs. However, riders may not be substituted. There will be NO EXCEPTIONS, so please do not ask. ● All money collected from exhibition runs (if provided) will be considered an office charge. ● Entry fees will be used for prizes and/or expenses. Entry fees will be determined by arena leadership and will be posted with the event information. Buckles will be awarded to 1st place of each age group. 2nd and 3rd place of each age group will be awarded a prize deemed appropriate by arena leadership. Series placings in each age group will be determined by the number of points held by the contestants at the end of the series. Placings will be given starting with highest number of points. Individual event placings will be given based on the competitor’s time, from quickest to slowest. Placings of each speed event, 1st-5th, will earn points as follows: 1st-5 points, 2nd-4 points, 3rd-3 points, 4th-2 points, 5th-1 point. Contestants must attend 3 out of 4 events of the series to be eligible for prizes. Cash only will be accepted for entry fees. Participation in the event is only open to children 4-7 years of age and 60 pounds or under while fully clothed on the date of the relevant event performance. Contestants will be weighed and birthdate will be required at the time of entry. Contestants will be required to wear a helmet during their ride which will be provided by Triple C Cowboy Church or stock contractor. Parents/Guardians are expected to ensure that their child(ren) are wearing/using the helmet appropriately. NO mutton bustin riggings or spurs are allowed at our events. If the sheep does not run, a second sheep(re-ride) will be given. Contestants will attempt to make the longest ride possible. A judge will assess each ride and award a score. Places will be determined by the highest scores in descending order. Contestants in the mutton bustin event will be able to enter until the last five (5) riders of the class. ● Once an entry is submitted, there will be no refunds, unless the rider is injured or incapacitated. The refund will ONLY be given IF the class has NOT begun. Riders may not be substituted. There will be NO EXCEPTIONS, so please do not ask. ● The the cloverleaf barrel pattern will be set as follows: 30 ft from the timer to the 1st & 2nd barrel, 90 ft between the 1st & 2nd barrel, 105 ft between the 1st and 2nd barrel to the 3rd barrel. ● The pole bending pattern will be set with 6 poles in a line, each pole will be 21 ft apart and 21 ft from the timer. The straight away barrel pattern will be set with three barrels in a line, 50 ft apart each and 50 ft from the timer. The speed race pattern will be set using the third barrel & timer set of the cloverleaf race. ● A three (3) call rule will be enforced. If not entering the arena in a timely manner (approximately 3-5 minutes) after the third call, you will be scratched. ● Stopping the forward motion of a horse (i.e. backing up) during the pattern will result in disqualification. Breaking the pattern of the designated class will result in a “no time”. ● For all classes a knocked over barrel/pole results in a five (5) second penalty per barrel/pole. ● A contestant may touch a pole or a barrel with their hands with no penalty. ● If you run out of order or enter in the incorrect class, you will receive a “no time”. ● A re-run/re-ride will be allowed if the Triple C Cowboy Church timekeeper fails to get a contestant's time due to clock malfunction. The contestant has the option to re-run either immediately or at the end of the class. The rider also has the option to receive a refund. ● A re-run/re-ride will not be allowed in the instances of contestant's equipment failure, nor will there be a refund of entry fees. ● In speed events, if the timekeeper fails to get a contestant's time due to a clock malfunction, and the rider makes a clean run (no “no time” penalties), the rider will be allowed to re-run (up to three re-runs) until the first clean (no “no time” penalties) run is made. ● The number in each drag will be determined by the arena leadership team, and the drags will be continuous throughout the classes. ● Contestants must compete in order drawn or may request to be last in a class. ● In case of a tie in a class, the prizes and/or money from the places involved will be added together and split equally between the tied contestants. ● All classes not yet awarded points will have the entry fees refunded.